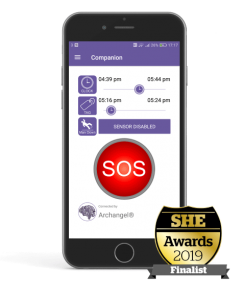 The Companion App and AL-i Bluetooth Button have been listed as a finalist in the ‘Innovation in Security’ category for 2019, Safety & Health Excellence Awards. The awards, which take place on April 10 at the NEC in Birmingham. Companion is a new IoT application for smartphones and Tablets. Companion mitigates all foreseeable remote worker risk’s including poor mobile signals. A waterproof Bluetooth accessory, the AL-i, automatically pairs and requires no charging, meaning lone workers can always raise an alarm while working up to 30m from their smartphone. In 2018 as part of an £800,000 investment in the business, we delivered a lone worker protection application which operates independently and across multiple devices. provided benefits for both individuals and employers. This resulted in the development of Companion and AL-i Bluetooth button. Companion App is an IoT-ready, white-label solution which is connected to, and synchronised with Archangel, a cloud-based monitoring system with a third-party API, and which has been awarded a prestigious Secured By Design designation by the National Police Chiefs Council. Archangel manages the data and routes the alerts to responders and Alarm Receiving Centres. Companion assures personal safety by managing risks. It does this by using a combination of methods including status flags, voicemail tags, free text messages, and risk exposure timers. Where falls and incapacitation are most likely, a ‘’man-down’’ feature is activated. The Bluetooth button, AL-i, delivers the most discreet method for raising an SOS. End users can raise an alarm while operating at a distance from the Companion-enabled smartphone, and this can also be configured to alarm silently and without alerting anyone nearby. Companion also accurately monitors the location of the device and makes this information available to lone worker managers and responders. Companion is unique because it contains advanced risk management features and multiple connectivity fail-safes to ensure that the lone worker status is always known. In an industry first, the ‘’man-down’’ provides optional detection for use in confined spaces and working at heights. Using advanced algorithms to validate genuine situations of jeopardy Companion utilities devices’ sensors data such as Impact, Tilt and Inactivity. This innovative approach distinguishes what will most likely be a genuine fall, greatly reducing the number of false alarms, bringing trust to the app from lone workers, and their responders. IoT ready, the app is synchronised with a cloud monitoring system, utilising internet connectivities to overcome not-spot signal areas, increasing opportunities to send an alert within buildings. Sophisticated technologies accurately trace the location, speed, method and direction of travel. Location is derived while operating both indoors and outdoors. An accurate location can then be shared with emergency services if required. Companion enables users to record and report their working activities either via text or speech offering Equality Act compliance. If dangerous circumstances prevent the lone worker from speaking, they may still indicate they need help, Companion has a screen-lock override button. For added discretion and convenience, AL-i automatically pairs to the Companion App and, weighing only 4 grams, it is the lightest Bluetooth button available today. AL-i’s form factor enables unobtrusive mounting to nearly anything. AL-i has an impressive 18 months battery performance and does not require recharging. Companion services may be white-labelled to suit commercial market opportunities. The global mobile workforce increasingly uses smartphones and tablets and a “grey vehicle fleet”. An emerging ‘’all-IP’’ communications network infrastructure and increasing adoption of cloud systems in the workplace are all factors which inspired us to develop “Companion” an advanced lone worker App with comprehensive location services. This is delivered as one commercial package and made accessible via white-label secure web services. Companion future-proofs the needs of the lone worker and their employer. Companion keeps staff safe, mitigates business risk, and drives efficiencies. Businesses save money because they can consolidate services and do not have to purchase separate lone working devices, SIM cards and tracking services. Companion provides a quick and effective security solution, it is installed on smartphones via App stores and MDM platforms, in a matter of minutes. The discreet and lightweight AL-i Bluetooth button comes with an adhesive backing allowing it to be attached to nearly anything, giving individuals and businesses opportunities for SOS buttons located in areas around warehouses or under office desks; wearable options via lanyards, ID cards, or on key chains. AL-i provides a flexible lone worker security solution in a diverse world of work. AL-i automatically pairs with any Companion App within its impressive 30m range. Therefore if an accident were to happen to a member of a team, such as a fall outside their own smartphone range, another team members smartphone within range can set off the alarm for their co-worker. Companion App and wearable SOS button keep staff safe, mitigates business risk, and drives efficiencies. Featuring advanced man-down technology, sophisticated location services, and discreet AL-i Bluetooth button, Safe Shores Monitoring believes it is the world’s most effective lone worker safety solution.